Color spit bite and soap ground aquatints with soft ground and hard ground etching and drypoint. Image size: 39¾ x 22¾"; paper size: 52¾ x 33¾". Edition 65. Aquatint reversal with scraping, burnishing and drypoint. Image size: 24 x 18"; paper size: 34 x 26½". Edition 15. Image size: 24 x 18"; paper size: 34 x 26½". Edition 85. Color aquatint with spit bite aquatint, soft ground etching and drypoint. Image size: 24 x 16"; paper size: 35¾ x 26½". Edition 85. Soft ground and hard ground etching with drypoint. Image size: 13 x 9"; paper size: 21 x 16". Edition 35. Image size: 18 x 13"; paper size: 27 x 21". Edition 35. Image size: 8 1/2 x 6 1/2"; paper size: 14 1/2 x 15 1/2". Edition 15. Image size: 8½ x 6½"; paper size: 16½ x 13½". Edition 15. Aquatint with sugar lift aquatint and flat bite etching. Image size: 6½ x 8½"; paper size: 14½ x 15½". Edition 25. Image size: 6½ x 6¾"; paper size: 13½ x 12¾". Edition 25. Aquatint reversal with hard ground etching and drypoint printed in black and blue. Image size: 20½ x 12¼"; paper size: 29½ x 20¼". Edition 35. Image size: 14¼ x 12¼"; paper size: 23¼ x 20". Edition 25. Sugar lift aquatint with soft ground etching and aquatint. Image size: 8½ x 6½"; paper size: 16½ x 13½". Edition 35. Image size: 8 x 6"; paper size: 17¼ x 13". Edition 25. Image size: 33½ x 23"; paper size: 37½ x 25½". Edition 200. Image size: 21¾ x 15"; paper size: 23 x 17¼". Edition 50. Color aquatint with soap ground aquatint. Image size: 13 x 21"; paper size: 25½ x 32¾". Edition 60. Aquatint with drypoint, soap ground aquatint and flat bite. Image size: 20 x 30"; paper size: 26 x 40". Edition 60. Published by Crown Point Press and printed by Marcia Bartholmea. Color aquatint with drypoint, soap ground aquatint and flat bite. Image size: 12 x 26"; paper size: 26 x 40". Edition 60. Color spit bite aquatint with soap ground aquatint and drypoint. Image size: 45 x 35¼"; paper size: 53¾ x 41½". Edition 60. Color soft ground etching with spit bite aquatint and drypoint. Image size: 15¾ x 30"; paper size: 26¾ x 40¼". Edition 60. Drypoint with hard ground etching and aquatint. Image size: 7 x 5"; paper size: 19¼ x 13¼. Edition 50. Image size: 4 x 5"; paper size: 19¼ x 13¼". Edition 50. Image size: 24 x 13½"; paper size: 25¾ x 35¾". Edition 35. Color aquatint with soap ground aquatint and drypoint. Image size: 8 x 10 1/4"; paper size: 26 x 20". Edition 25. Color soap ground and spit bite aquatints with drypoint. Image size: 24 x 36"; paper size: 35¾ x 49". Edition 50. Image size: 40 x 25"; paper size: 42¼ x 27". Edition 200. Color aquatint with hard ground etching and drypoint. Image size: 22 x 19"; paper size: 35 x 26¾". Edition 35. Image size: 19 x 20"; paper size: 33 x 26". Edition 35. Image size: 22 x 17"; paper size: 33½ x 27". Edition 35. Sugar lift aquatint with flat bite etching. Image size: 8¾ x 7"; paper size: 23½ x 18½". Edition 50. Color sugar lift aquatint with flat bite etching. Image size: 12 x 9"; paper size: 18½ x 23". Edition 35. Image size: 10¼ x 9"; paper size: 23 x 18½". Edition 50. Image size: 16 x 14¾"; paper size: 33 x 26½". Edition 35. Color sugar lift aquatint with hard ground etching and drypoint. Image size: 9 x 10"; paper size: 26¼ x 19½". Edition 50. Image size: 15 x 24"; paper size: 26½ x 40". Edition 35. Image size: 18 x 24"; paper size: 40 x 26½". Edition 35. Image size: 18 x 24"; paper size: 26½ x 40. Edition 35. Image size: 24 x 15"; paper size: 40 x 26½". Edition 35. Image size: 24 x 15"; paper size: 37 x 26¾". Edition 40. Image size: 10 x 13½"; paper size: 22 x 30". Edition 35. Aquatint with hard ground etching and drypoint printed in black and brown. Image size: 13½ x 19½"; paper size: 30½ x 22". Edition 35. Image size: 18¾ x 17¾"; paper size: 37½ x 30½". Edition 35. Image size: 11 x 13"; paper size: 22 x 30". Edition 35. Image size: 15½ x 13½"; paper size: 31 x 24¼". Edition 40. Image size: 18 x 19"; paper size: 36½ x 30½". Edition 35. Image size: 13½ x 9½"; paper size: 30½ x 22". Edition 35. Image size: 18¾ x 17¾"; paper size: 37½ x 30¾". Edition 35. Image size: 18¾ x 17¾"; paper size: 37½ x 30½". Edition 22. Image size: 15 x 12"; paper size: 30 x 23". Edition 35. Color drypoint with hard ground etching and aquatint. Image size: 11 x 15½"; paper size: 19 x 26½". Edition 19. Image size: 11 x 15½"; paper size: 26 x 19". Edition 35. Image size: 11 x 9¾"; paper size: 28 x 20". Edition 35. Image size: 24 x 14½"; paper size: 40 x 26". Edition 35. Color spit bite aquatint with soft ground etching. Image size: 12 x 8¼"; paper size: 26½ x 19". Edition 35. Image size: 11¾ x 4"; paper size: 26 x 14". Edition 35. Portfolio of four etchings with aquatint and drypoint. Image size: varies; paper size: 19 x 13". Edition 35. Aquatint with hard ground etching, drypoint and roulette. Image size: 6 x 5¾"; paper size: 19 x 13". Edition 35. Hard ground etching with drypoint and roulette. Image size: 5 x 4"; paper size: 19 x 13". Edition 35. Drypoint with hard ground etching. Image size: 6½ x 5"; paper size: 19 x 13". Edition 35. Portfolio of five aquatints with drypoint. Image size: 11 x 8"; paper size: 19 x 13". Edition 35. Image size: 11 x 8"; paper size: 40 x 26". Edition 35. Image size: 17½ x 12½"; paper size: 40 x 26". Edition 35. Image size: 30 x 22"; paper size: 40 x 26". Edition 35. Image size: 20 x 11"; paper size: 40 x 26". Edition 35. Portfolio of nine drypoint and hard ground etchings. Image size: varies; paper size: 30 x 22". Edition 25. Drypoint; from 41 Etchings Drypoints. Image size: 5¾ x 9¼"; paper size: 17¾ x 14¾". Edition 25. Hard ground etching; from 41 Etchings Drypoints. Image size: 8¼ x 9¾"; paper size: 17¾ x 14¾". Edition 25. Soft ground etching; from 41 Etchings Drypoints. Image size: 9¾ x 7"; paper size: 17¾ x 14¾". Edition 25. Image size: 7¾ x 12¾"; paper size: 17 x 14¼". Edition 25. Aquatint with hard ground etching; from 41 Etchings Drypoints. Image size: 9½ x 7¾"; paper size: 17¾ x 14¾". Edition 25. Image size: 7¾ x 5½"; paper size: 17¾ x 14¾". Edition 25. Image size: 8¼ x 7¾"; paper size: 17¾ x 14¾". Edition 25. Aquatint with soft ground etching; from 41 Etchings Drypoints. Image size: 5¾ x 8¼"; paper size: 17¾ x 14¾". Edition 25. Image size: 6¾ x 7"; paper size: 17¾ x 14¾". Edition 25. Drypoint; from 41 Etchings Drypoints,. Image size: 11 x 6¾"; paper size: 17¾ x 14¾". Edition 25. Image size: 9½ x 8"; paper size: 17¾ x 14¾". Edition 25. Image size: 11¼ x 8"; paper size: 17¾ x 14¾". Edition 25. Image size: 11¾ x 7¼"; paper size: 17¾ X 14¾". Edition 25. Hard ground etching with drypoint; from 41 Etchings Drypoints. Image size: 12 x 9"; paper size: 17¾ x 14¾". Edition 25. Image size: 12 x 9¼"; paper size: 17¾ x 14¾". Edition 25. Image size: 13¼ x 9¾"; paper size: 17¾ x 14¾". Edition 25. Aquatint with drypoint and hard ground etching; from 41 Etchings Drypoints. Image size: 12½ x 8¾"; paper size: 17¾ x 14¾". Edition 25. Image size: 8 x 9½"; paper size: 17¾ x 14¾". Edition 25. Image size: 7¾ x 6½"; paper size: 17¾ x 14¾". Edition 25. Image size: 4½ x 14¾"; paper size: 17¾ x 14¾". Edition 25. Image size: 8½ x 5¾"; paper size: 17¾ x 14¾". Edition 25. Image size: 8 x 6"; paper size: 17¾ x 14¾". Edition 25. Image size: 8¼ x 6¾"; paper size: 17¾ x 14¾". Edition 25. Image size: 12¾ x 9¾"; paper size: 17¾ x 14¾". Edition 25. Image size: 8¾ x 7"; paper size: 17¾ x 14¾". Edition 25. Image size: 11 x 8½"; paper size: 17¾ x 14¾". Edition 25. Image size: 7½ x 12"; paper size: 17¾ x 14¾". Edition 25. Image size: 13 x 7"; paper size: 17¾ x 14¾". Edition 25. Drypoint with hard ground etching and scraping; from 41 Etchings Drypoints. Soft ground etching with drypoint; from 41 Etchings Drypoints. Image size: 7 x 5¾"; paper size: 17¾ x 14¾". Edition 25. Image size: 7¾ x 11½"; paper size: 17¾ x 14¾". Edition 25. Aquatint with hard ground etching and drypoint; from 41 Etchings Drypoints. Image size: 11¾ x 9¾"; paper size: 17¾ x 14¾". Edition 25. Image size: 7¾ x 6¼"; paper size: 17¾ x 14¾". Edition 25. Image size: 8½ x 11"; paper size: 17¾ x 14¾". Edition 25. Image size: 8½ x 11½"; paper size: 17¾ x 14¾". Edition 25. Drypoint with hard ground etching; from 41 Etchings Drypoints. Image size: 11 x 9¾"; paper size: 17¾ x 14¾". Edition 25. Image size: 8½ x 8"; paper size: 17¾ x 14¾". Edition 25. Image size: 13 x 9¾"; paper size: 17¾ x 14¾". Edition 25. Image size: 5 x 4¼"; paper size: 17¾ x 14¾". Edition 25. Diebenkorn was born in Portland, Oregon, in 1922 and grew up in San Francisco. He attended Stanford University for two years, then in 1943 enlisted in the U.S. Marines. After getting out of the service late in 1945, Diebenkorn headed for New York City. Short of funds after a few months, he moved to Woodstock, New York. He returned to the Bay Area in 1947 to live in Sausalito and teach at the California School of Fine Arts (now the San Francisco Art Institute). In 1950, he went to Albuquerque, New Mexico, to get a graduate degree on the GI Bill, then, in 1952, moved to Urbana, Illinois, where he briefly taught. People familiar with Diebenkorn’s work are also familiar with the places where he lived, as he titled his paintings after the locations where he did them. In the fall of 1953, Diebenkorn returned to the San Francisco Bay Area and settled in Berkeley, where he remained until 1966, when he accepted a faculty position at the University of California at Los Angeles. He lived in Los Angeles, painting his Ocean Park series, until 1988, when he returned to the San Francisco Bay Area to live in Healdsburg. Diebenkorn is influential both as a painter and as a printmaker. He began making prints at Crown Point Press in 1962 and returned regularly to the press until his death. He also made a number of lithographs, most of them at Gemini G.E.L. in Los Angeles. Diebenkorn’s first one-person museum exhibition was at the California Palace of the Legion of Honor in San Francisco in 1948. In 1976, the Albright-Knox Art Gallery in Buffalo, New York, organized a retrospective that traveled to the Whitney Museum of American Art, New York, and other institutions, and in 1978 Diebenkorn represented the United States in the Venice Biennale. The Museum of Modern Art in New York presented a retrospective of his drawings in 1988, and in 1997 the Whitney Museum mounted a major painting retrospective that traveled to the San Francisco Museum of Modern Art, the Phillips Collection in Washington, DC, and the Modern Art Museum of Fort Worth. The Royal Academy of Arts, London, presented a solo exhibition by the artist in 2015, and in 2016 the SFMOMA and the Baltimore Museum of Art co-curated Matisse/Diebenkorn, which explored the inspiration Diebenkorn found in the work of French artist Henri Matisse. It opened in Baltimore in October 2016 and in San Francisco in March 2017. His work is in the collections of the above museums and many others. The Richard Diebenkorn Foundation released a four-volume catalog raisonné on the artist’s unique works in 2016. The estate of Richard Diebenkorn is represented by Van Doren Waxter, New York. 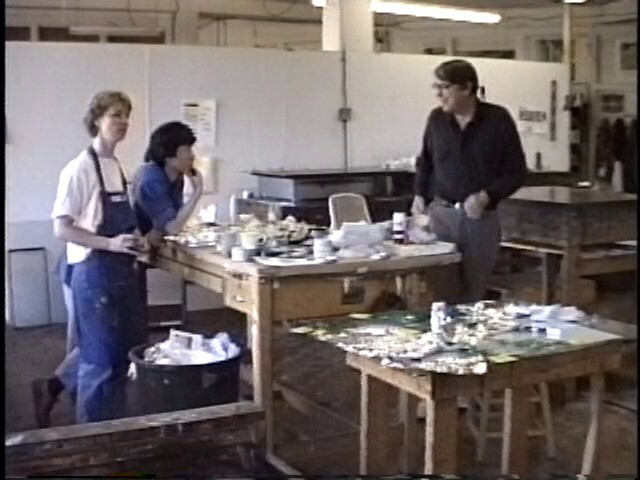 Watch this 15-minute video of Richard Diebenkorn in the Crown Point studios making the large seminal etching, "Green." Artist Richard Diebenkorn makes an etching at Crown Point Press in San Francisco, 1986. 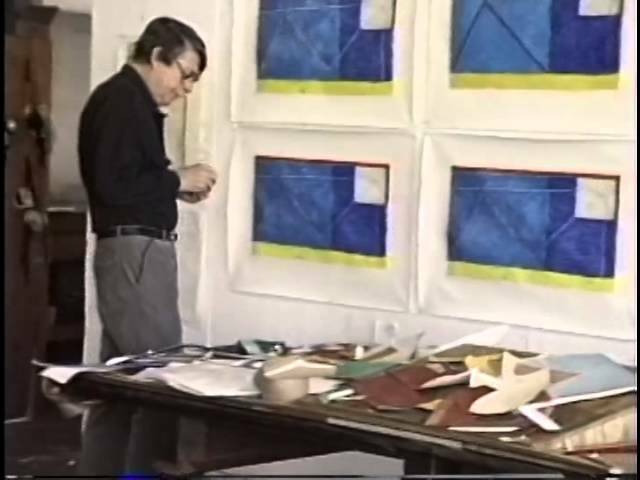 Watch Richard Diebenkorn at work on the large aquatint, Green; Red-Yellow-Blue; and an unfinished print. 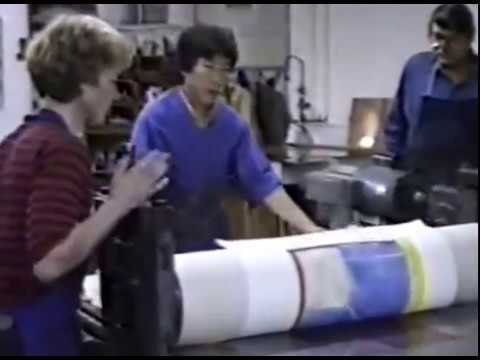 In this video, shot by Kathan Brown, Diebenkorn works through the process of creating an etching with printer Marcia Bartholme.